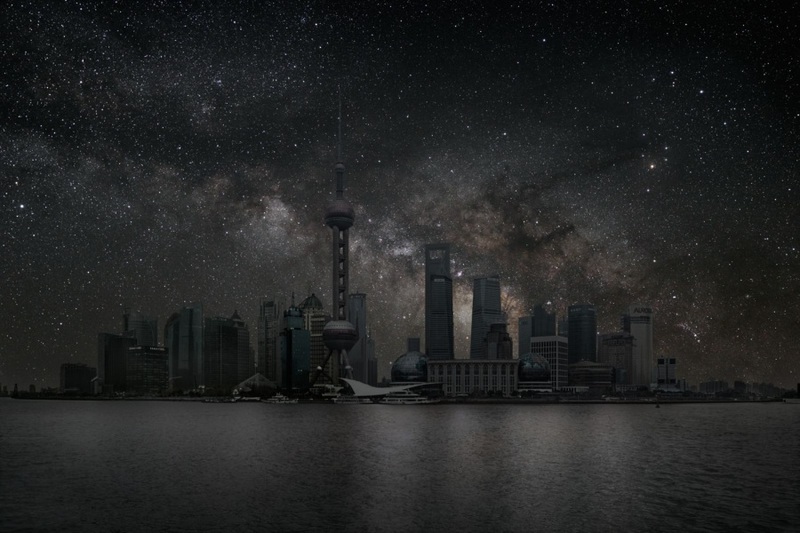 Explanation: In a haunting vista you can never see, bright stars and the central Milky Way rise over the dark skyline of metropolitan Pudong in Shanghai, China. Looking east across the Huangpu River, the cityscape includes Pudong's 470 meter tall Oriental Pearl Tower. The night sky stretches from Antares and the stars of Scorpius at the far right, to Altair in Aquila at the left. To create the vision of an unseen reality, part of a series of Darkened Cities, photographer Thierry Cohen has combined a daytime image of the city skyline with an image matched in orientation from a dark sky region at the same latitude, just west of Merzouga, Morocco. The result finds the night sky that hours earlier also arced over Shanghai, but drowned in the lights of a city upon the sea.